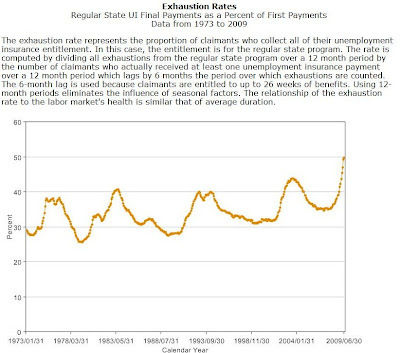 Unemployment Benefits – More Math that Just Doesn’t Work/ More Data Hiding? This article was meant to be a short follow up to Employment Situation in Chart Form – Damn, I knew I should have moved to New York and found a job on Wall Street! Didn’t quite turn out to be so short or simple ;-) Let’s see if I can, in one million words or less, describe what’s happening with the money behind the very simple (eyeroll) government unemployment system. That’s nice. When the math works. Federal and state payroll taxes on employers finance the UI program. The federal government uses the proceeds from its payroll tax to (1) pay for all program administrative costs and one-half of extended benefit payments and (2) maintain a loan account from which financially troubled states can borrow funds to pay UI benefits. The gross federal tax rate is 6.2 percent on the first $7,000 paid annually by employers on each employee. If a state meets federal requirements, and has no delinquent federal loans, however, its employers are eligible for up to a 5.4 percent credit, making the net federal tax rate 0.8 percent. To receive the maximum federal tax credit, states must, among other things, establish a taxable wage base for state UI taxes at least equal to the federal wage base—currently $7,000. 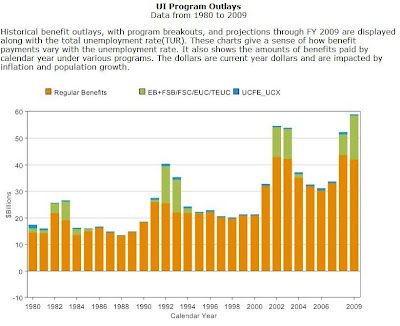 Most of the funds used to pay UI benefits come from the states, which levy a payroll tax on employers to finance regular UI benefits and one-half of extended benefits. States generally structure their UI taxes to include several tax rate components or schedules. In accordance with federal law, within a tax schedule, an employer’s tax rate will vary according to the firm’s experience in laying off workers who subsequently receive UI benefits, commonly called their experience rating. Those firms with many unemployed workers receiving UI benefits will generally pay a higher UI tax rate than firms with few workers receiving unemployment insurance. These tax rate schedules also vary according to some measure of a state’s trust fund balance, with the highest tax schedules generally applying when state fund balances have fallen below a specified level. Each state maintains its own trust fund with the U.S. Treasury that is used for depositing program income and from which UI benefits are paid. The experience-rating aspect of the unemployment insurance systems is unique in the world—the United States is the only nation that finances its UI system though an experience-rated tax. The objectives of experience rating are (1) the prevention of unemployment by inducing employers to stabilize their operations and thus their employment, so as to reduce their tax rates, and (2) the equitable allocation of costs of unemployment benefits. Which is it, and where did the data go? Note that the fund peaked in 2001, fell, rebounded and then… NO DATA since 2005! Again, pulled up the raw data and nothing past 2005 – again nothing comparable at Treasury. So, I sent them an email requesting to know what happened to the data. I have not yet received a response and have delayed posting this story waiting for their answer, but will now simply have to update you with their answer IF they provide one. Gee, why is the money always so hard to see when we run into money held by the Treasury? So, is the fund broke or not? Let’s do a little more investigating and perform some simple math working from the data provided to come up with the best estimate we can for today. Ah, actually, THAT is NOT the amount collected from 1971 through 2008. In fact, it is simply the amount for 2006, the last year there is data available. I know this because once again I pulled the raw data and looked. Why is the data not available? At any rate, you can see that total collections were roughly $39 billion in 2006. Let’s call that income. Look at the year 2006. Looks to me like $32 billion was spent and we know that $39 billion was taken in – a $7 billion surplus, plus or minus. That’s cool. But then look at what happened in 2008 and now in 2009. Expenditures have jumped into the $52 to $60 billion range. 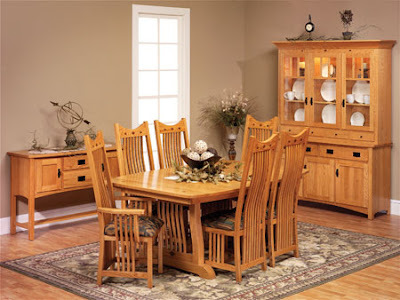 That’s not so cool when you’re only taking in $39 or LESS – and less is what I’m betting on with unemployment skyrocketing – but let’s just say that income has remained steady – we don’t know. In 2008 there would have been a $13 billion+ deficit and in 2009, it looks like it will be in the $20 billion range IF tax collections remain constant (they won’t) AND their projection for 2009 is close (it’s not, guaranteed). And it dropped from $38 billion to ZERO in one year – well, according to the charts showing income (2006) and outgoes (2008) there was a $13 billion deficit in 2008 – where did the other money go? IT WAS PAID OUT IN LOANS TO THE STATES. How many states now have INSOLVENT funds? 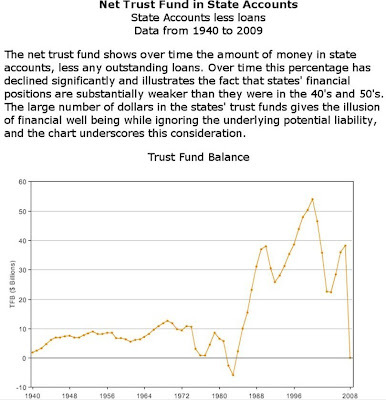 Thirty-two state trust funds are below the federally recommended level of having cash reserves equal to a year's worth of recession-level payments. A number of states will need federal assistance for jobless funds during this economic slowdown, said Andrew Stettner, deputy director of the National Employment Law Project. 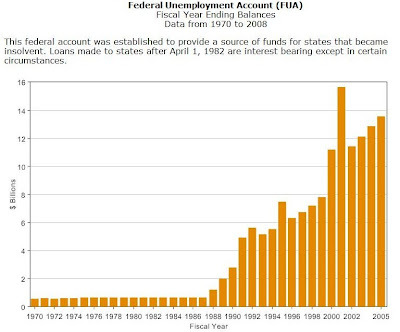 (CNN) -- The demand for unemployment benefits across the country has put a strain on state unemployment funds, with such funds in at least 10 states facing insolvency in 2009, according to a policy group. Nationwide, unemployment reached 6.1 percent, or roughly 9.1 million people, in August, up from 4.7 percent in 2007, and is expected to continue rising. The U.S. Department of Labor said that in August, claims for unemployment benefits reached their highest levels since 2001, in large part because of hurricane activity on the Gulf Coast. With a weekly average of 474,000 new applicants in August, in a system already looking after about 3.5 million people each week, the growing rate of recipients has nearly depleted unemployment funds in several states. "There are some real serious problems with unemployment funding that need to be addressed," said Andrew Stettner, deputy director of the National Employment Law Project, a policy group that advocates on behalf of unemployed and low-wage workers. Now it seems that one state after another is declaring their UI funds short (insolvent) and are being forced to ask the Treasury for loans. Just this weekend Alabama was the latest: State seeks federal money to back jobless trust fund. At the end of last year, the Governor of South Carolina, Mark Sanford, REFUSED to take out a loan, but ultimately capitulated. A very interesting read, I’m certain there were other pressures not mentioned in that article, probably emanating from Treasury, but that’s just my speculation, lol. For weeks, Mr. Sanford, newly elected as head of the Republican Governors Association and known for being a fierce free-market foe of government spending, stuck to his stand, questioning the probity of the South Carolina Employment Security Commission and demanding a new audit of the agency. He has said in the past that he did not trust the commission’s calculation of the state’s unemployment rate, though a spokesman at the Bureau of Labor Statistics said it was calculated the same way as in every other state. Mr. Sanford is now demanding that South Carolina’s Commerce Department, whose director he appoints, be given access to the state unemployment agency’s numbers, including where applicants are from, their ages, genders and occupations. Hmmm… seems that even the Governor can’t trust the data or get the data! Of course Sanford’s obvious sanity is CALLED INSANE by guess who? Uh huh, Chairman of the Senate Finance Committee – another Central Banker lackey! “Take the loan so that we can control the state too. – oh, and I can’t believe how cruel and heartless he is for not taking a loan and further bankrupting his own state.” LOL! Demanding an audit of the agency? That’s what Stanford wants, and exactly what should be done to include the TREASURY as well. In fact, the entire program from top to bottom doesn’t add up to me and should be audited. What I want to know is, where is the money coming from for the loans? 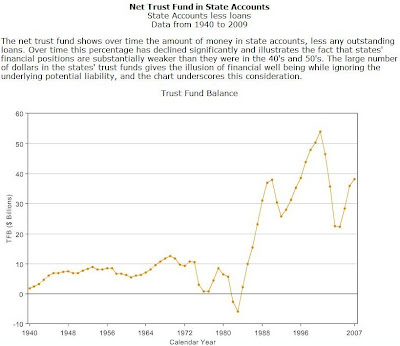 How Negative is the Treasury’s UI trust fund? From Q1 ’08 to Q1 ’09, the Exhaustion rate rose from 36% to 45%, an increase of 25%. The number of new UI claims and payments increased 52% and 53% respectively. That’s 18 million new claims, or nearly 6% of the entire population forced to become new unemployment money recipients in the past year alone. That’s 7.5% of the 238 million civilian noninstitutional population – new claims, this past year alone. The State of California is a big source of new claims. Their UI trust fund is forecast to be $18 billion in the hole by next year! At the beginning of this year, their fund nearly ran out of money for the second time in the past 5 years and was saved by basically robbing Peter to pay Paul in a state assisted money shell game. 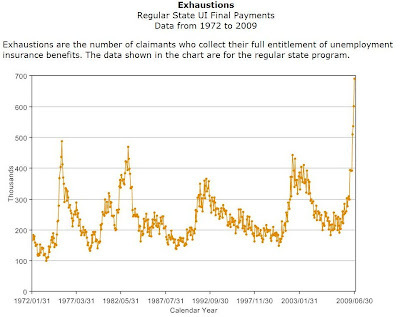 Unemployment benefits received in 2008 and prior years remain fully taxable. To summarize, there are now 10 states that are INSOLVENT in their UI trust funds and there are many more getting closer to the edge. I cannot ascertain how much total money is remaining in the Treasury’s UI trust fund and there is incomplete and missing data at the Department of Labor’s site. The longer the high unemployment drags on, the worse the financial situation is going to get. Tim Geithner says he’ll look into extending benefits further at the end of this year. My question, Timmy, is where does the money come from? You going to print up some more? 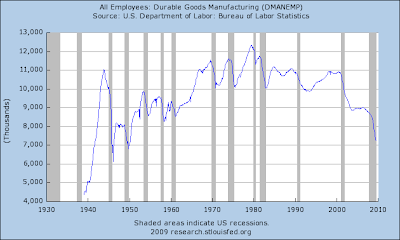 Take a good look at the following chart of total employees in durable goods manufacturing and tell me where the jobs are going to come from to make the program solvent going forward? 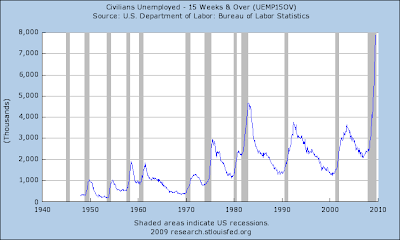 Now take a look at those on unemployment for 15 weeks or longer. 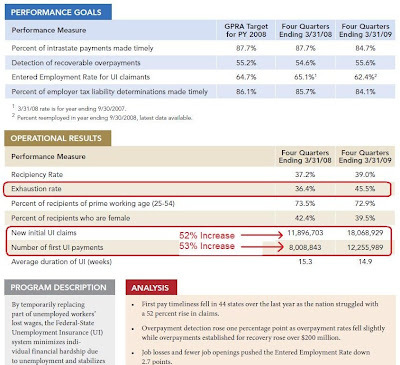 How do you think the DOL’s projections are going to hold up for 2009? It’s all about assumptions and Ponzi schemes work until the money coming in no longer pays the prior contributors. Are we at that point now? I think so… let’s audit the Fed, the Treasury, and the Department of Labor and find out what’s behind our casino like government!